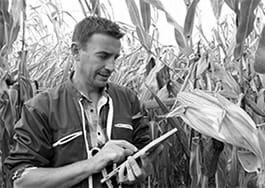 Mixed crop farm managers plan, organise and coordinate the activities and resources of farming establishments cultivating arable crops. Plan farm strategy, targets, finances and production. Decide or advise on the kind of crops to be grown, and the area to be sown or planted. Purchase machinery, equipment and supplies, such as seed, fertiliser and chemicals. Plan the type, intensity and sequence of farm operations (e.g. determine the best time for planting, spraying and harvesting). Recruit, train, direct, coordinate and supervise staff. Maintain and monitor quality of produce, ensuring compliance with regulations. Establish market strategies, market and arrange for the sale of crops and other farm produce. Produce and maintain records of production and finances, and prepare financial and operational reports. Apply health and safety standards across the farm estate. Arrange the maintenance and repair of farm buildings, machinery and equipment. Manage the farm products by making contracts with customers and business partners to ensure the optimal production, taking into account the farms production plans and purpose. Evaluate the development of new technologies and ideas and make decisions as to their use and appropriateness to a given farming situation. Perform customer adapted presentations of the farm organization and farm processes taking under consideration the farm sustainability and local environment. Manage farm supplies by taking care of the purchase and storing procedures. Select and purchase supplies and equipment such as seeds, livestock feed, fertilisers and farm machinery. Market the products of the farm. Make sure that the product is ready for marketing and introduce the products to customers by using appropriate marketing methods.